Read the articles published about vasculitis patients, and fundraisers for Vasculitis UK, who have had their stories told in the national, regional and local media. Item covering the launch of a new Charity Single by local song writing duo, Clarry Bean and Andy Merryweather, ‘Christmas (The Way it’s Meant To Be)’. Clarry Bean sadly lost his wife, Christine, just 12 days before Christmas in 2017. She had received treatment for several years for both a rare autoimmune disease, Granulomatosis with Polyangiitis Vasculitis and bowel cancer. Profile of GPA sufferer Janine Baxter on Lincolnshire Live website. The death of a mum-of-three from a condition where the immune system attacks the body has led her sister to launch a campaign to save others. University of Dundee student Elizabeth Ferris (30), who collected her medical degree on Friday, 23rd June. Elizabeth was diagnosed with Vasculitis, an autoimmune disorder that causes inflammation of the blood vessels. Coupled with blindness in one eye, the inflammation then struck her spine. As a result of this life changing illness she had to take three years out from her studies. "Living with a Rare Disease is like having a full time job"
A FATHER of two is taking on the highest peak in Wales just twelve months after being induced into a coma. Antony and Sally Hart are looking to raise awareness of Vasculitis, which affects their son Giles, in Hastings. Andrew Robertson has been fundraising for Arthritis UK Research, and now is fundraising for Vasculitis UK. The dinner, held in February 2014, raised £4700 for Vasculitis UK. Jim, aged 62, was a senior referee in Scotland and lost his battle with Vasculitis, two years after being diagnosed. "THE DOCTORS THOUGHT IT WAS ARTHRITIS"
Susan French’s brother Paul French, died aged 69 in September 2014 after initially being treated for arthritis in the muscles. The Bath Chronicle - March 2015. The friends and family of a 24-year-old nurse who died from a rare autoimmune disease have started a charity campaign after learning about her condition for the first time. Warrington Journal - Sept 2014. Peter Micallef undertook sit ups and press ups and took the ice bucket challenge in September 2014. YouTube video - Aug 2014. Andrew raises awareness of vasculitis when he rallies. This video was of the REIS Asphalt Rally Championships - Tyneside stages. Andrew came 2nd in the B9 class. Newmarket Journal - Aug 2014. The Newmarket teenager who never thought he would live to take his "A" levels is now preparing to go to university. The Northern Echo - July 2014. Emily is 12 years old. When she was 10 she suffered a stroke and was subsequently diagnosed with Central Nervous System Vasculitis. The Stroke Asscoiation's Life After Stroke Award was presented to Emily. Bucks Free Press - July 2014. Former GB rower and environmentalist, Dave Hampton, took to the Thames for a gruelling upstream swim along the Henley Regatta course he used to row to raise funds for V-UK. Bicester Advertiser - June 2014. A group of mothers from the Cherwell Valley (the Valley Girls) are planning a 470 km cycle ride across Rajastan in February 2015 to raise funds for Vasculitis UK. St Helens Star - 8th May 2014. A team of 25 fundraisers, lead by Natalie Moulsdale, will tackle the ascent of the highest mountain in Wales to raise funds in memory of her father, Neale, who died from vasculitis. The team are raising money for Vasculitis UK. Loughborough Echo - 15th April 2014 GPA sufferer, Martin, runs for research work. Martin from Mountsorrel ran the Loughborough Half Marathon while undergoing chemotherapy and has raised around £650 to help vasculitis research. Student Journal - 14th March 2014 Actor and writer Harold Ramis (Ghostbursters and Groundhog Days) dies at the age of 69. The well loved actor/director Harold Ramis died on Monday 24th February aged 69, due to complications with a long term autoimmune disease. Ghosbusters UK are fundraising for Vasculitis UK during 2014 in memory of Harold Ramis. Further details can be found on the UK Ghostbuster's website. The Huddersfield Daily Examiner - 8th March 2014 Toddler Bethan Speak's parents open up on rare condition that makes daughter's skin look like she's been beaten. Loughborough Echo 6th March 2014 Distance runner Martin enters the Loughborough Half Marathon despite being on chemotherapy for the treatment of vasculitis. He may not reach his personal best but Martin will give it a good try for Vasculitis UK. Mail Online - Femail - 27th January 2014 "Doctors told me that chemotherapy would make me infertile" - Joy for Holly who feared treatment for rare disease would stop her becoming a mother. On 16th January 2013, John Mills, Chairman of Vasculitis UK was interviewed by BBC television. Watch the video - Vasculitis: Tackling the disorders that destroy the blood cells. They were preparing us for the worst' - Enfield family spreads word about son's rare condition. This is Local London - May 2013. The family of a teenager who were "prepared for the worst" after he was diagnosed with a rare and incurable condition are launching a campaign to raise awareness. Julie's "flu" turned out to be vasculitis The York Press - May 2013. When Julie returned from a dream holiday in Florida she started to feel unwell. She put it down to symptoms of 'flu or tiredness. Martyn fights back from disease to tackle charity trek Worcester News - April 2013. Martyn fought a rare, debilitating disease and is now looking for people to join in a sponsored walk later this year. Walker Martyn Wells aims to beat rare disease and raise funds for Vasculitis UK Worcester News - 4 July 2013. Martyn and friends completed the gruelling 31 mile Worcester Way Walk on 29th June 2013. Teacher spent weeks in agony before disease diagnosis" ThisistotalEssex (Brentwood Gazzette - May 2013. An English teacher who nearly died on her wedding night from a rare disease is sharing her experience with others. Two teams of parents battled it out on the football field to raise money for Vasculitis UK, in memory of Clare Grossman who died due to complications of vasculitis. Northern Ireland Health Minister, Edwin Poots, launches the Vasculitis Ireland Awareness charity on 29th May 2013. Also shown in the photograph are Julie Powers (leader of the charity) and Professor Mark Little. Chris Jewson and his daughter Sarah Pittaway preparing for the Worcester Way Walk on 29th June 2013. 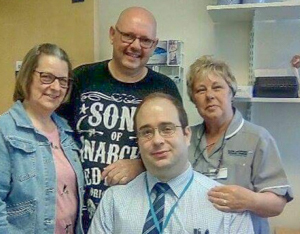 David Starling donates a kidney to his nephew Ryan Davies who has Wegener's Granulomatosis Wales Online - 10 July 2013.